This allows the chassis design to be much smaller than traditional sized amplifiers. The BRT also has a variable hi-level DC offset turn-on circuit for easy installation into any OEM system. It is great for smaller stealth installations, as well as for motorcycles and recreational vehicles. ROCKFORD FOSGATE POWER T500X1BR. Flexible vehicle integration enabled through low-level and high-level inputs with auto turn-on. 1 Channel 500 Watts Mono Amplifier. Total Power: 500 Watts. 500 Watts x 1 @ 1-Ohm. The P1000X2 is an excellent way to PUNCH up your sound system without monopolizing your entire trunk - that way you have more room for subs! Rated Power (RMS Continuous Power) Total Power (Sum of Rated Power): 1000 Watts RMS. Says Sergey of K&B Audio. "The amplifier is without a doubt the most efficient Class A/B amplifier I've ever tested.". Power T400-2 400 Watt 2-Channel Amplifier. Heat Sink Type: Cast aluminum. Number of Channels: 2. The most convenient way to get low frequency bass in your system is to drop-in a Punch Loaded enclosure. Punch Loaded enclosures are constructed with durable 5/8" MDF and tuned by our computer aided design software. 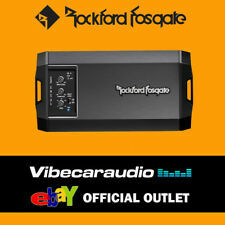 Rockford Fosgate Power T800-4AD 800 Watt 4-Channel Car Amplifier. Rated Power(RMS Continuous Power) Total Power (Sum of Rated Power): 800 Watts RMS. Heat Sink Type: Cast aluminium. Number of Channels: 4. The PBR300X1 is a 300 Watt amplifier with Boosted Rail Technology, allowing it to be compact and efficient while providing big power. This amp is great for smaller stealth installations, motorcycles and recreational vehicles. ROCKFORD FOSGATE PUNCH P1000X5 AMPLIFIER. AUTHORISED ROCKFORD FOSGATE UK DEALER. It's that simple — your amplifier is now set to match your receiver's output. The Punch EQ2 includes bass and treble boosts, in case you want to liven up the mix. Full-range mono amplifier. Class-AB amplifier design. speaker-level inputs. preamp inputs and outputs. Rockford Fosgate R500x1D. With small and well-installable heatsinks and easy-to-operate set-up, they have the legendary Rockford Power also for a small budget. Class D Mono Amplifier. Punch EQ 0-18 dB bass boost (45 Hz). ROCKFORD FOSGATE R400-4 D. Class D 4-Channel Amplifier. Broom field 8. 35108 Allendorf. We are always there for you. Sound Products Frank Heukamp. Skip to range. All freshly arrived for you. In addition to 4-channel stereo mode, you can bridge both channels to create a high power 2-channel amp, or run stereo speakers on the front with subwoofers on the rear in 3-channel mode. The variable HP/LP crossover and built-in Punch EQ allows for precise tuning of Bass frequencies and the Pass-Thru RCA jacks provide flexibility as your system grows and keeping Y-adapters to a minimum. Details:With its super efficient Class-BD circuit topology, the P1000X1bd assures maximum BOOM for your buck! Due to its dedicated low frequency response, this amplifier is optimized for mid-bass speakers or subwoofers only. The R150X2 can also run in bridged/mono mode for use with subwoofers. Bridgeable: Yes. Heat Sink Type: Extruded Aluminum. Number of Channels: 2. (Sum of Rated Power) : 150 Watts RMS. 150 Watts x 1 @ 4-Ohm Bridged. The P300X2 is a solid choice if you're looking to drive a pair of coaxial speakers, component speakers, or a single subwoofer. The amplifier can also be run in stereo/mono mode simultaneously when using passive crossovers (not supplied) on all speakers. 200 W x 1 @ 4 Ohms Bridged RMS. 100 W x 2 @ 2 Ohms RMS. Damping Factor >200. Stereo/mix frequency response: 20 to 20k Hz /-. 5 dB. IM Distortion <.08%. Slew Rate 30 Volts/ms. Crossover : LP 40-400Hz 12dB per Octave. 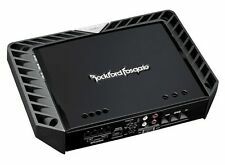 ROCKFORD FOSGATE POWER T1000-1BDCP. The new Constant Power amplifiers are the most powerful amplifiers on the market PERIOD! The listening experience is cleaner, louder and more impressive than ever before. Rockford Fosgate Punch P1-1X12 - Single R1 12” 500 Watt Loaded Enclosure. Flexible vehicle integration enabled through low-level and high-level inputs with auto turn-on. Rockford Fosgate proprietary Boosted Rail technology. Rated Power (RMS Continuous Power) Differential inputs with high level auto turn-on feature. Number of Channels: 4. Front Channels. Rear Channels. Total Power (Sum of Rated Power): 1000 Watts RMS. Front Channels - Punch EQ. 500 Watts x 2 @ 4-Ohms Bridged. Rear Channels - Punch EQ. 500 Watts x 2 @ 2-Ohms Bridged. The Punch P400X2 is a 2-channel stereo amplifier capable of producing 200 Watts into each channel at 2-Ohms. The P400X2 amplifier is great with full-range or component systems or can be bridged for use with 2 or more subwoofers. You can also use the P400X1 for multi-speaker center channel applications. It's variable crossover and built-in Punch EQ allow for precise tuning of Bass frequencies, and its 2-Ohm mono stability is perfect for running up to four 4-Ohm DVC subwoofers. Rockford Fosgate proprietary Boosted Rail technology. 500 Watts x 1 @ 1-Ohm. Total Power: 500 Watts. Differential inputs with high level auto turn-on feature. 8 AWG Power/Ground connector. 10 AWG speaker connector. Due to its dedicated low frequency response, this amplifier is optimized for mid-bass speakers or subwoofers only. On-board Punch EQ with 18dB boost @ 45Hz. Total Power (Sum of Rated Power): 500 Watts RMS. The built-in frequency filters and Rockford Fosgate's famous Punch bass boost allow you to adjust the amp to work best with your speaker setup and your vehicle. 40 watts RMS x 2 at 4 ohms (65 watts RMS x 2 at 2 ohms). Rockford Fosgate R250x1. With small and well-installable heatsinks and easy-to-operate set-up, they have the legendary Rockford Power also for a small budget. Class AB Mono Amplifier. Punch EQ 0-18 dB bass boost (45 Hz). Rockford Fosgate R500x1D. Sinus Leistung 1 x 500Watt. Class D Mono block amplifier. Phase switch 0 ° / 180 °. Anzahl Kanäle 1-Kanal (Mono). Class-D technology of the latest generation. High level inputs. The amplifier is without a doubt the most efficient Class A/B amplifier I've ever tested. ". Rated Power (RMS Continuous Power) Total Power (Sum of Rated Power) 400 Watts RMS. says Sergey of K&B Audio. ROCKFORD FOSGATE R150X2. Class AB 2-Channel Amplifier. Broom field 8. Sound Products Frank Heukamp. Sounds simple - it is! Skip to range. All freshly arrived for you. Ending Soon. ROCKFORD FOSGATE PUNCH PBR300X2. You won't believe how small and powerful this amp is. Rockford Fosgate's PBR300X2 2-channel amp puts out 100 watts RMS each to a pair of speakers, all from an amp you can easily hold in one hand. This amplifier is optimized for 4-channel front/rear systems so you can run midrange/tweeters in the front doors/dash while running midrange/tweeters in the rear doors/deck. Match with a mono amplifier for subwoofers and you'll have a Rockford Fosgate system that any Car Audio Fanatic will envy. Rockford Fosgate R250x1. Sinus Leistung 1 x 250Watt. Class AB Mono block amplifier. Phase switch 0 ° / 180 °. Anzahl Kanäle 1-Kanal (Mono). Class FROM the latest generation technology. High level inputs. 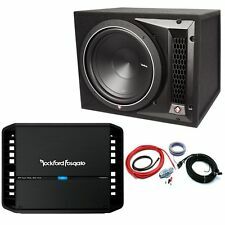 ROCKFORD FOSGATE Punch P1000X1BD. 1 Channel 1000 Watts Mono Amplifier. On-board Punch EQ with 18dB boost @ 45Hz. Total Power (Sum of Rated Power): 1000 Watts RMS. 500 Watts x 1 @ 2-Ohm. 1000 Watts x 1 @ 1-Ohm. The Power T750x1bd is an ultra-compact, Class bd 750 Watt mono amplifier. Perfect for hybrid, electric, small cars, trucks, motorcycles, and side-by-side UTVs. ROCKFORD FOSGATE POWER T750X1BR. Rockford Fosgate proprietary low impedance Constant Power. ROCKFORD FOSGATE POWER T500-1BDCP. The frequency response of the T500-1bdCP is optimized exclusively for use with subwoofers. Mono 500 Watts Stereo Amplifier. Circuit Topology Class: Class bd. Total Power (Sum of Rated Power): 500 Watts RMS. Rockford Fosgate P300X2. The latest PUNCH generation impresses with an excellent sound and performance in a compact and elegant design. 0% financing up to 60 months duration! We have the decision of the Bank after a few minutes. 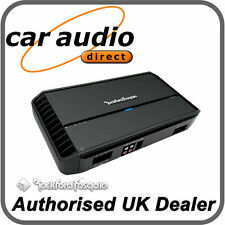 AUTHORISED ROCKFORD FOSGATE UK DEALER. The versatile R750-1D puts out 400 watts RMS to a 4-ohm sub, but will crank out 750 watts RMS when it's running a 1-ohm subwoofer setup. 250 watts RMS x 1 at 4 ohms (500 watts RMS x 1 at 2 ohms). 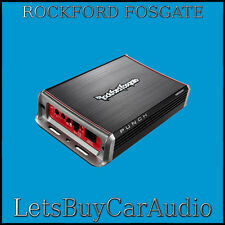 Rockford Fosgate T500-1bdCP 500W - Mono Car Amplifier. The listening experience is cleaner, louder and more impressive than ever before. With the T500-1bdCP, you can now use an "under-the-seat" dedicated subwoofer amplifier to drive two 4-Ohm DVC subwoofers. ROCKFORD FOSGATE PUNCH P1000X1BD AMPLIFIER. And the P1000X1bd can drive a 1-ohm load, so you can power multiple subs without any trouble. 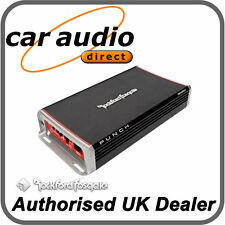 AUTHORISED ROCKFORD FOSGATE UK DEALER. 300 watts RMS x 1 at 4 ohms (600 watts RMS x 1 at 2 ohms). Match with a 4-channel stereo amplifier for your mids/highs and you'll have a Rockford Fosgate system that any Car Audio Fanatic will envy. Total Power (Sum of Rated Power): 750 Watts RMS. 750 Watts x 1 @ 1-Ohm. It's variable crossover and built-in Punch EQ allow for precise tuning of Bass frequencies, and its 2-Ohm mono stability is perfect for running up to four 4-Ohm DVC subwoofers. Sized to fit under any seat, you can hide this amplifier and have them guessing where the amp is. Details:The P300X1 is perfect for use as a dedicated subwoofer or center channel amplifier. On-board Punch EQ with 18dB boost @ 45Hz. Punch EQ2 Treble: 0dB to 12.5dB @ 12kHz. High level input capable with Auto Turn-On circuit. The PBR500X1 is a 500 Watt amplifier with Boosted Rail Technology, allowing it to be compact and efficient while providing big power. This amp is great for smaller stealth installations, motorcycles and recreational vehicles.